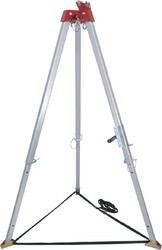 Leading Wholesale Distributor of karam pn800 tripod and karam cantilever k-pod pn 900 from Pune. Having two auxiliary eye bolts as attachment points. Aluminium alloy cast head, legs in Aluminium. Strength of anchorage point greater than 12 kN. Every Tripod is provided with inbuilt fixture for attaching our winch PN 801, PN 817, PN 818, PN 818 SR, PN 801(40) (can be supplied without this fixture on special request). PN 800 (7ft) can also be used with Retrieval Fall Arrester Blocks PCGS 10R, PCGS 20R & PCGS 30R with the help of their specialized mounting brackets respectively. 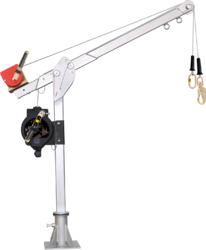 The unique feature is that the height of the Cantilever arm of the K-Pod is adjustable at 3 defined points, with upper height adjustment of 2.3m, middle arm adjustment of 1.9m, and lowered arm adjustment at 1.5m. This enables the use of the K-Pod even in those areas where the roof height is small. The K-Pod can be easily mounted on the floor as well as on the wall through special floor and wall mounting brackets which are made available as per need. The K-Pod can also be mounted on the floor of heavy vehicles, hence making it extremely versatile in use. KARAM Winch PN 801, PN 801(40), PN 817 & PN 818 can be easily mounted on to the K-Pod with the help of stainless steel fasteners. Retrieval Fall Arrester Block Ref. PCGS 30R, PCGS 20R & PCGS 10R can also be installed for easy retrieval & arresting the fall of the user using the specialized mounting brackets; Ref.PN 900(06), PN 900(07) & PN 900(08) respectively. Looking for CONFINED SPACE ENTRY ?